Our Simply RackPc Chassis takes a traditional design, ideal for Standard Pc parts in a 4u Chassis. • material thickness: 1.0MM. • Case Material: High Magang no flowers galvanized sheet. • Panel Setup: two USB 3.0, a power switch, a reset switch, a power indicator, a hard disk light. The chassis is custom designed using rolled steel (not made from aluminium) to allow 4 x 3.5 HDD drives to be fitted along with 2 x SSD, slim optical and Micro ATX motherboard. It is designed for a 24/7 heavy load application with fans at the front and back to direct airflow. Chassis Form Factor Rack or Pedestal. Board Form Factor ATX. Integrated LAN 2x 1GbE. # of LAN Ports 2. # of Serial Ports 2. Total # of SATA Ports 6. # of USB Ports 6. Removable plates top and bottom for cable entry or mounting cable glands. Colour Black. Ending Soon. At Albuhera, we specialise in the ever-exciting world of PC components, AV and IT technologies. If you are ordering from outside of the mainland UK, e.g. Fast Dispatch. New Arrivals. Quick Release doors and Side panels. Adjustable front and Rear 19" mounting profiles. Removable cable entry panel in top and base. Each cabinet is designed with strength, ease of use and aesthetics in mind. This 1U chassis is designed for a compact server system based on mini ITX system. Mini 1U Chassis. Chassis Type. Form Factor. 1 x VGA, IPMI, 4 x LANs, 1 x COM, 4 x USB, 1 x Keyboard / Mouse. Front Ports. 1U Micro Rack Mount Server Case. 450mm deep wall mounted network/data/comms cabinet. Also available in 390mm, 450mm, 500mm, 550mm and 600mm. Each cabinet is designed with strength, ease of use and aesthetics in mind. A gland plate is situated in the top and bottom of the cabinet. 9U 450mm deep wall mounted data/network/comms cabinet. Cable access top and bottom. Cable Entry Top & Bottom. Mounting Profiles 19" Adjustable Front & Rear. Side Panels Removable. CAN ACCEPT ATX OR MICROATX (MATX) MOTHERBOARDS, (WITHOUT RISER). NO FANS IN THIS CASING. These cases are ideal for anyone wishing to build their own WEB server, DVR CCTV system, or DJ's. Black hard wearing powder coated finish to case. 1U 200mm Deep Chassis Enclosure. 1u in height and 200mm Depth. Easily accesable front, rear and top. Motherboard (for CSE- 512F-350B). 14.5" Mini 1U chassis - supports maximum motherboard sizes: ATX 12" x 10". Servers (for CSE- 512F-350B). Worked with most Supermicro SIngle dual CPUs for the size up to 12" x 10". 15u 19" 600mm Deep Wall Mounted Data Cabinet for Patch Panel PDU Comms Network Product data sheet. Also available in 390mm, 450mm, 500mm, 550mm and 600mm. Each cabinet is designed with strength, ease of use and aesthetics in mind. CAN ACCEPT ATX OR MICROATX (MATX) MOTHERBOARDS, (WITHOUT RISER). These cases are ideal for anyone wishing to build their own WEB server, DVR CCTV system, or DJ's. Black hard wearing powder coated finish to case. Previously used in our office, includes patch panel, cabling and ready to go sockets that may come in handy. 1u in size. 19" Rack Mount Brush Plate. 19" Rack mount brush plate. 38.5cm brush width. to the front of network switches to allow cabling to be passed through and to keep dust out. Used 1u rack blanks 6 no. 6U 19" 550MM Deep Black Wall Mounted Data Cabinet Patch Panel. Also available in 390mm, 450mm, 500mm, 550mm and 600mm. A gland plate is situated in the top and bottom of the cabinet. The cabinets feature ventilation slots top and bottom; and have a lockable glass front door, and removable sides. SANUS VuePoint FPA400 is a single-column AV component system that mounts directly under wall-mounted TVs for a sleek, streamlined look. Its center column features an integrated channel for easy power cable and signal wire routing. T330 T430 and many others. Dell Ready Rail Kit. •Front panel (from our 4U range of panels - others could be used ie- XLR). Chassis enclosure size is width 436 mm x Height 175 mm x depth 390 mm. Panel and enclosure fixing screws . 4.4U 19" front blank panel. •Heights:2U &3U. •Front panel (from our 3U range of panels - others could be used ie- XLR). Panel and enclosure fixing screws . Contents -Easy assembly kit. 4.3U 19" front blank panel. 390mm X 436mm X 133mm. •Heights:2U &3U. •Front panel (from our 3U range of panels - others could be used ie- XLR). Panel and enclosure fixing screws . 4.3U 19" front blank panel. 15U 500mm 19" Black Wall Cabinet Network Data Rack Patch Panel, PDU & LAN Switch. Also available in 390mm, 450mm, 500mm, 550mm and 600mm. 12U 500mm 19" Black Wall Cabinet Network Data Rack Patch Panel, PDU & LAN Switch Product data sheet. •Front panel (from our 4U range of panels - others could be used ie- XLR). Chassis enclosure size is width 436 mm x Height 175 mm x depth 300 mm. Panel and enclosure fixing screws . 4.3U 19" front blank panel. •Front panel (from our 5U range of panels ). Chassis enclosure size is width 436 mm x Height 221 mm x depth 390 mm. Panel and enclosure fixing screws . Contents -Easy assembly kit. 4.5U 19" front blank panel. Cable access top and bottom. Cable Entry Top & Bottom. Mounting Profiles 19" Adjustable Front & Rear. Side Panels Removable. •Front panel (from our 6U range of panels ). Chassis enclosure size is width 436 mm x Height 266 mm x depth 300 mm. Panel and enclosure fixing screws . Contents -Easy assembly kit. 4.6U 19" front blank panel. 2U 200mm Deep Chassis Enclosure. 2u in height and 200mm Depth. Easily accesable front, rear and top. Also available in 390mm, 450mm, 500mm, 550mm and 600mm. A gland plate is situated in the top and bottom of the cabinet. The cabinets feature ventilation slots top and bottom; and have a lockable glass front door, and removable sides. 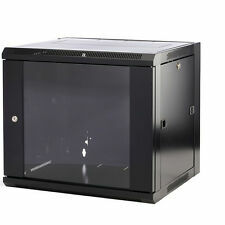 18u 19" 600mm Deep Wall Mounted Data Cabinet for Patch Panel PDU Comms Network Product data sheet. Also available in 390mm, 450mm, 500mm, 550mm and 600mm. Each cabinet is designed with strength, ease of use and aesthetics in mind. Or can fit a standard ATX motherboard with the IO panel included in the sale (see photo) this needs to be fitted. 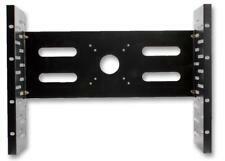 Model 1U 19" Rack Mounting Fan. Rack Unit Height 1U. Rack Unit Width 19". Fully tested, 100% working condition. Warranty covers hardware only. Software support is NOT provided. Used, tested, working. 9U 19" 600MM Deep Black Wall Mounted Data Cabinet Patch Panel Comms Network Product data sheet. Also available in 390mm, 450mm, 500mm, 550mm and 600mm. Each cabinet is designed with strength, ease of use and aesthetics in mind. 15u 19" 600mm Deep Wall Mounted Data Cabinet for Patch Panel PDU Comms Network. 15u 19" 600mm Deep Wall Mounted Data Cabinet for Patch Panel PDU Comms Network Product data sheet. Also available in 390mm, 450mm, 500mm, 550mm and 600mm. 390mm deep wall mounted network/data/comms cabinet. Also available in 390mm, 450mm, 500mm, 550mm and 600mm. 12U 19" 390MM Network Cabinet Rack Wall Mounted Black Data Comms Patch Panel Product data sheet.